RICHARD DONAGHY REPORTS ON THE SIXTH WEEKEND VISIT OF THE CBO 2015 SEASON. A team of five volunteers including Ian McKee, who planned to stay for a week to progress with the first serious attack on the grass-cutting, departed Donaghadee on Friday 15th May for the sixth weekend visit of the CBO 2015 season. [Ian was joined for the remainder of the week by another volunteer on the boat switchover on Sunday]. The weekend weather remained dry throughout but with constant winds blowing at around 20 mph coming from the west/south west. Sunday morning brought this nicest weather with a drop in the winds and a near cloudless sky. The breeding season is in full swing on the island with large numbers of Eider, Black Guillemot, Black-headed Gull, Common Gull, Herring Gull and Lesser-black Backed Gull sitting on eggs. The team also spotted nesting Oystercatcher and saw the first two Eider chicks of the year. 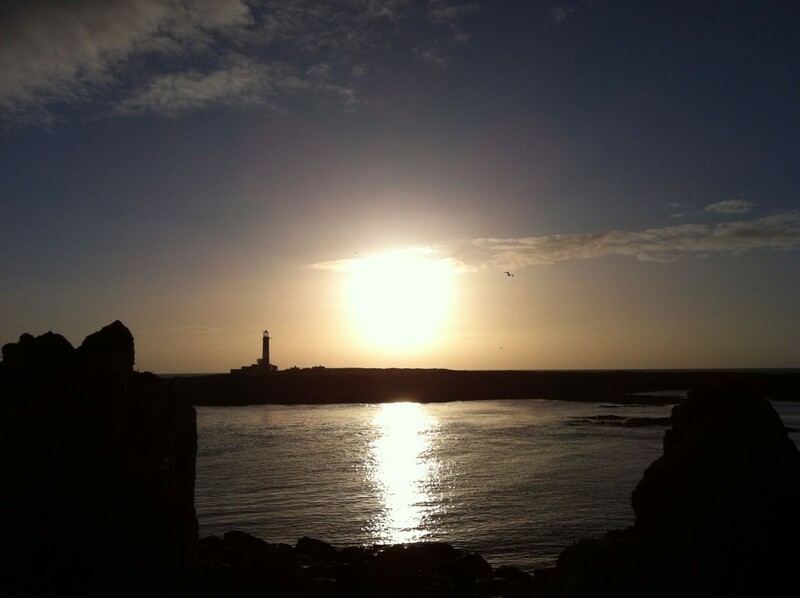 The Fulmars are sitting on the ledges on the East cliffs and a pair of Rock Pipits are bobbing around the foreshore. The pair of Starlings which nest in the workshop were working tirelessly to feed to their noisy brood, flying back and forth across the island continuously in the hunt for insects. The local Swallows were checking out the usual nest sites around the Observatory buildings and the cave. Two curious Swallows flew into the ringing laboratory on Friday evening to look for an ideal nest site and were caught and ringed. Many of the other resident breeders remained inconspicuous, so may be sitting on eggs e.g. female Reed Buntings, Shelduck and Stock Doves. The Arctic Tern numbers are building; reaching c180 birds on Saturday 16th May but we expect plenty more to arrive. Four Puffins were again present with two sitting among the decoys. A highlight for the species list was a pair of Red-breasted Mergansers, spotted on the sound between Lighthouse Island and Mew. 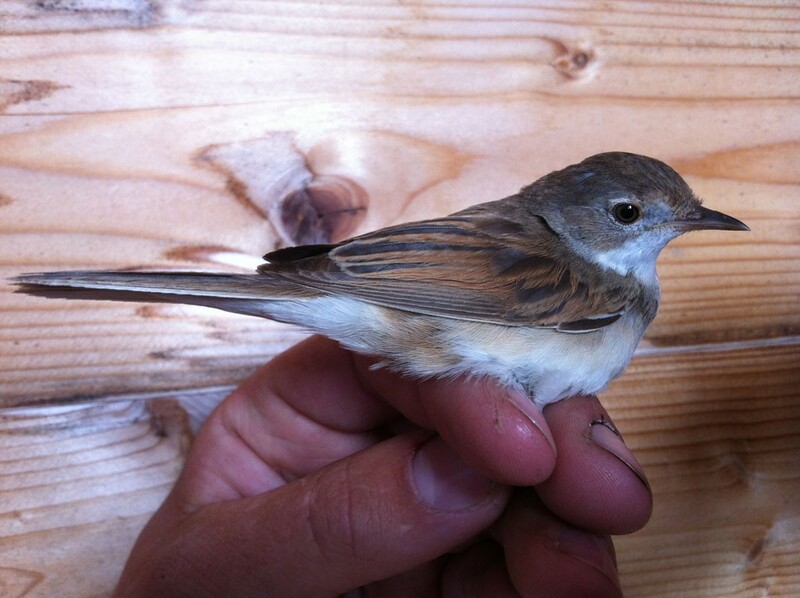 In terms of passerine migrants (except Swallows) the Island appeared to be devoid of any birds on Friday evening and Saturday morning between 5-9am. Birds then started to appear with a Spotted Flycatcher, a Blackcap and a Chiffchaff feeding in one tree in Bluebell Gully. 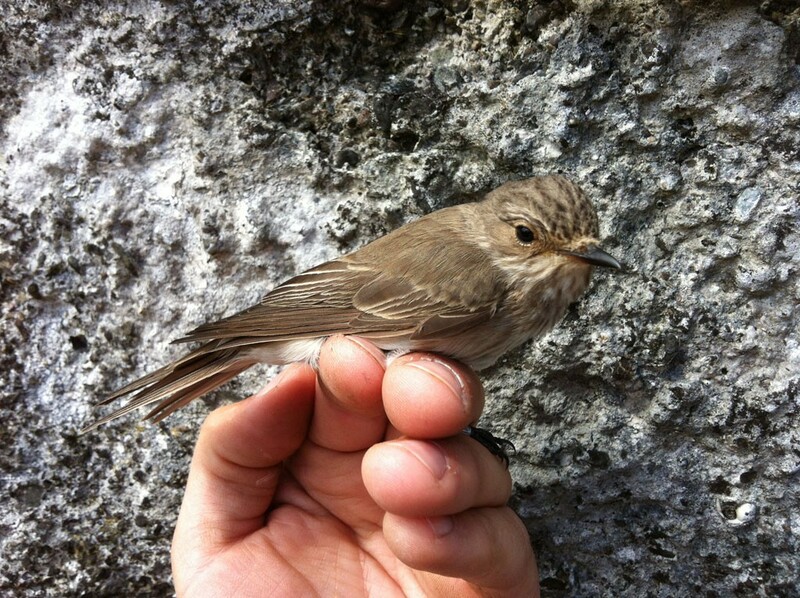 The ringing then picked up with a Spotted Flycatcher, a couple of Chiffchaff and a Whitethroat caught. 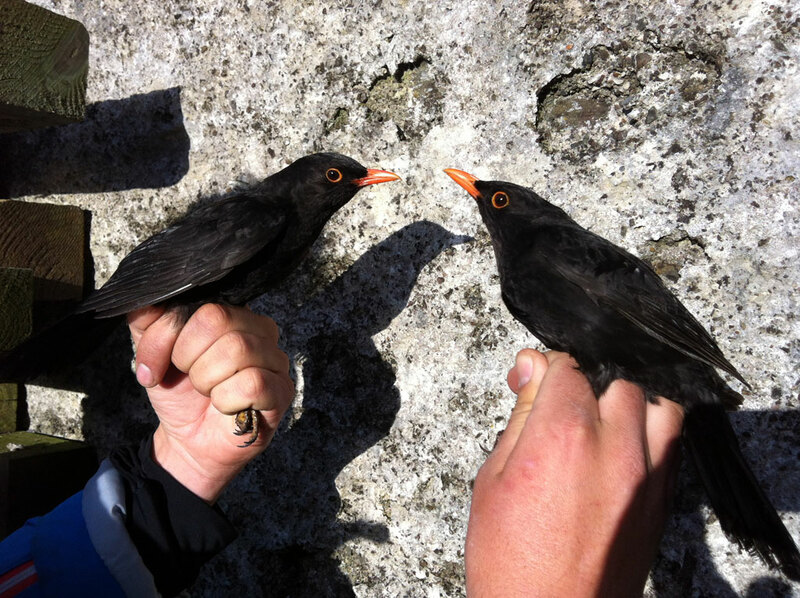 These birds appeared just in time to show to a group of 20+ people who had arrived by boat on a guided island tour. The baited crow trap then produced some birds, with 5 Jackdaws and a Magpie inside – although 2 of the Jackdaw and the Magpie managed to slip out when extracting them. A busy couple of hours quietened down after midday. Swallows were the only obvious persistent migrant, with birds flitting through much of the day with 9 ringed and a single House Martin, of which 4/5 passed through. On Sunday the conditions between 6-8am were ideal with full cloud cover and force 3 winds coming from the south west. 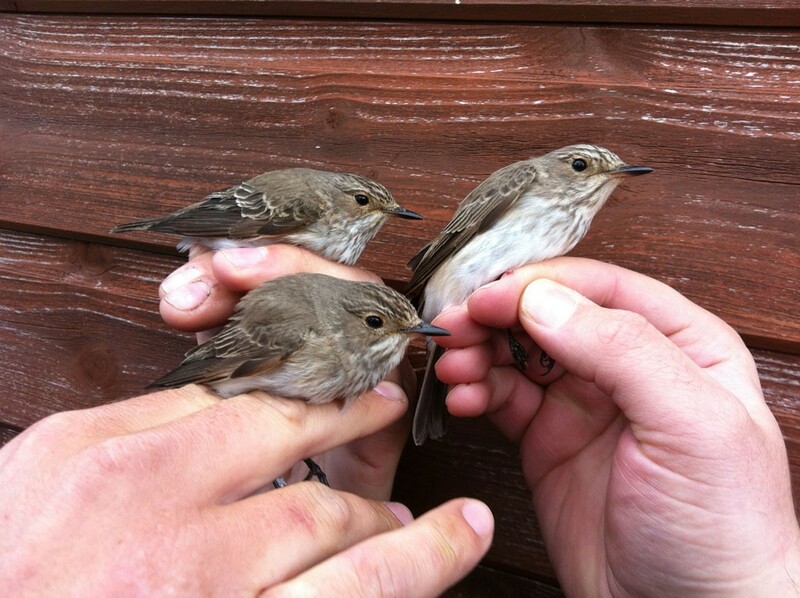 The first two net rounds caught the majority of the day’s birds, with the second round producing a Spotted Flycatcher in the ‘Heli trap’, a Chiffchaff in the ‘Garden net’, and the ‘Withy net’, which was the best of the lot, produced 2 Spotted Flycatchers, 3 Blackcap and a Reed Bunting. A few more birds were picked up through the rest of the morning but, with the wind increasing, and switching back to westerly, many of the migrants seemed to have moved on.